In the end, all those fake Chairman Mao pins and Little Red Books will only collect dust back at home. 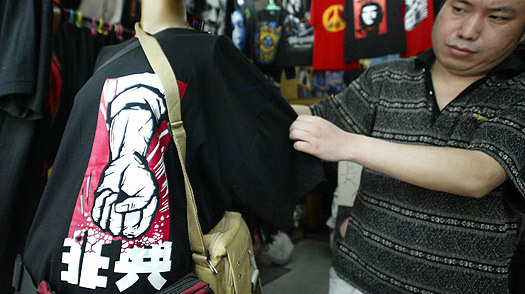 Instead, stock up on 180-yuan tongue-in-cheek propaganda T-shirts at Shirtflag, which has several outlets in town, including ones on Taikang Road and Nanchang Road. Choose from, among other designs, a satirical "Supermao" graphic that pokes fun at Cultural Revolution posters or a "Worker, Peasant, Soldier" motif in which a soldier and peasant lock lips  something that could have earned a harsh punishment in more puritanical times.